softly brushing the twilight sky. winking and blinking through the night. while sweetly, quiet dreams are made. a glimpse of light shoots 'cross the skies. hoping to wish upon a shooting star. have covered the star studded plain. to bring the spectacle in sight. hopefully watching for just a few. sparkling, twinkling just for you. to see a few is not enough. sometimes filled with foolish pride. of life that only faith can bring. me with many wishes fulfilled. to match the goodness in store. is waiting patiently at my door. The glow of dawn brushes the sky. filled with love and work and play. that I have nothing for which to pine. knowing sleep will win the fight. softly, softly my dreams I'll keep. Due to the holiday and multiple internet outages over the weekend, the folks at LearningHerbs.com have extended the cut off date for their Culinary Herbalism Course until Wednesday at midnight! We've been enjoying the recipe for authentic yogi tea!! If you've been thinking about the new Culinary Herbalism Course from LearningHerbs.com but haven't checked it out, take a moment to see what's cooking over there! Sign up for the course is only open until Saturday or until it's full. After that, it won't be offered again until some time in 2012. This segment will be the only one that has K.P. there to answer questions and the price will more than double next time around. It will only take a minute to look over the info and decide for yourself. 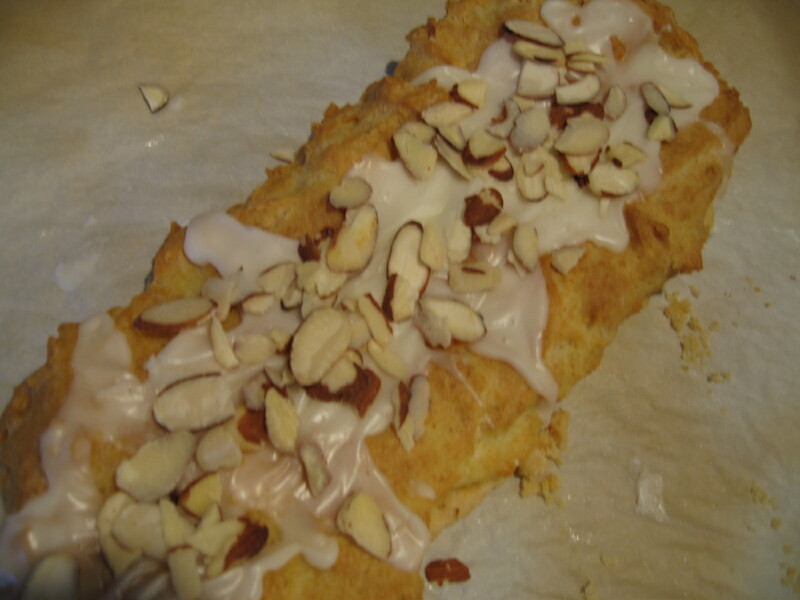 The original recipe for this pastry treat came from an old Pillsbury cookbook. I've substituted a little to include butter, evap cane juice and unrefined flour. In a small bowl, blend flour and butter with a pastry blender until pea sized lumps form. Sprinkle with water 1 Tbsp at a time. Blend with a fork just until a soft dough forms. divide dough in half, on an ungreased cookie sheet, press half of the dough into a 12" by 3" strip. Note: I lined my cookie sheet with parchment paper. This makes it easy to remove the fragile pastry crust from the sheet as soon as it comes out of the oven. In a medium saucepan, heat water and butter to boiling. Remove from heat and immediately stir in flour until smooth. Add eggs, 1 at a time, beating until smooth after each one. Spoon 1/2 batter over each crust up to 3/4" from the edges. Bake for 50-60 minutes until golden brown and puffy. Remove from pan, cool 15 minutes. Topping will shrink and fall. While pastry is cooling, blend all frosting ingredients, except nuts, in a small bowl until smooth. Cut each into 8-10 slices and serve. This is a holiday favorite that's become a bit of a tradition. We all look forward to it a couple times each year. Yummy.